Porcelain is a great surface for mixing paint! 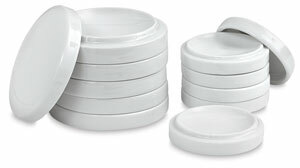 These nesting porcelain bowls are so easy to clean, and they stack neatly when you need to store them. Porcelain is weighty, so these mixing bowls won't slide around while in use. Thanks to their sturdy construction, they will last you for many years. The small bowl measures 75 mm (just under 3") in diameter, and each bowl is 13 mm (about ½") tall. The large bowl measures 100 mm (just under 4") in diameter, and is about 15 mm tall. Each set comes with one cover lid.